At Sure Foot Industries, our goal is to keep people safe by offering high-quality products that businesses can use anywhere there is pedestrian traffic. One place where our products work especially well is on steps. Our grit-coated fiberglass step covers and non-slip stair treads offer unparalleled durability and are a cost-effective safety measure that any business can use. Our grit-coated fiberglass step covers are available in 11.75-inch widths to suit many business applications, from scaffolding to ladders and more. These fiberglass stair treads are available with a colored strip to increase pedestrian awareness of a potential safety hazard. Our standard color strip is yellow, although we can also design a customized piece to go with a building’s existing color scheme. The grit-coated fiberglass step covers we offer are built to last. No matter how much foot traffic a business receives, our products won’t wear away or degrade over time. We maintain a high level of quality and longevity for every product in our line. When a building owner or manager is ready to take action and increase the safety in and around a building, we’re here to provide the materials to get the job done. 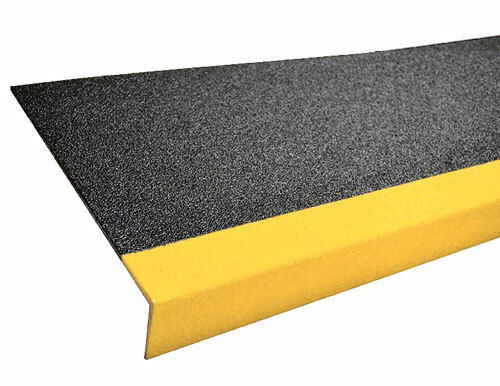 Contact us to speak with a representative about ordering our grit-coated fiberglass step covers for your workplace!